Leading and engaging Millennials requires a new skillset. A leader-coach mindset requires collaborative skills and less advice-giving. Coaching, rather than traditional leading, may encourage Millennial nurses to grow in place rather than change jobs in search of new challenges. Karen is a seasoned manager of a labor and delivery unit. Robert is a Millennial new graduate who just completed his first year on the unit. Karen is pleased with Robert’s transition and feels that he’s making good progress in his new role. During his first performance evaluation, Robert tells Karen that he’s mastered the RN role on the unit and feels bored. He wants to know what he can do now toward his goal of moving ahead in his career, possibly into a key leadership role. Karen is surprised by Robert’s self-assessment of his clinical competency. She doesn’t think it’s an accurate reflection of where he is professionally. Scenarios like this are playing out every day in our healthcare system. Millennials’ career expectations are different than previous generations’. They establish goals for themselves and are willing to leave organizations for other opportunities. Millennial turnover in the first year of employment has become a significant challenge in many organizations. Based on her past leadership experience, Karen’s initial response in this situation might be to focus on addressing Robert’s clinical deficits. If she chooses this approach, the outcome may result in Robert leaving the unit for better opportunities in another setting. Millennials expect more coaching and regular feedback than any other generation in the workplace. Leadership strategies that worked well for decades may no longer be effective in engaging and retaining these nurses. They place significant value on organizations and leaders who devote time and energy to helping them transition into their current roles and also assist in career planning for the future. Leaders who have a traditional mindset about being grateful to have a job and “paying your dues before advancing” will fail to engage this generation. As a seasoned manager, Karen will need to shift her management thinking. Focusing on performance alone won’t promote the type of work culture that nourishes Millennial staff like Robert. Building clinical competency matters, but a manager who recognizes the importance of being a leader coach will also help young nurses build a career development plan. The goal should be to help them progress on their desired career path while continuing to develop clinical skills. Adopting a leader coach mindset is challenging for some nurse leaders. You’ll need a different skillset. Coaching is a collaborative relationship between the coach and the nurse. It uses conversations to help the nurse achieve his or her goals; the coach’s role is to facilitate meaningful conversations and let the nurses lead with their own ideas. Active listening is key to effective coaching. Rather than give advice, a coach teaches and directs. Managers like Karen are typically selected for leadership roles because they’re effective problem solvers. She may be tempted to jump into action to solve a problem or give advice because that’s how she sees herself adding value. Moving from being the problem solver to a coach takes practice. Robert wants to feel as if he’s getting ahead in his career, so Karen will need to explore with him what that means. Leaders are frequently asked for advice, and giving it is okay, but don’t rush into the advice-giving mode. Michael Bungay Stanier, a leadership coaching expert, describes this as taming the advice monster. For example, Karen will need to ask open-ended questions, even when every fiber in her body wants to solve the problem or develop a career plan for Robert based on what she thinks is in his best interest. However, telling Robert what to do won’t promote his growth and can lead to learned helplessness. The most pow­erful way for Karen to guide Robert is to help him to think more broadly for himself. Listening, reflecting on what she hears and senses, and then ask­ing powerful questions can change how Robert sees himself and the world around him. Karen also may need to harness Robert’s creativity and talents in a way that will contribute to the organization and promote engagement. To become an effective leader coach, you’ll need to draw on best practices in coaching. Most coaching models have similar steps. During this step, focus on relationship building and assessing needs and opportunities for growth. For example, Karen could begin part of the process with Robert right after his annual evaluation. Using open-ended questions, she can seek clarification about the goals he mentioned during his evaluation. (See Open-ended coaching questions.) 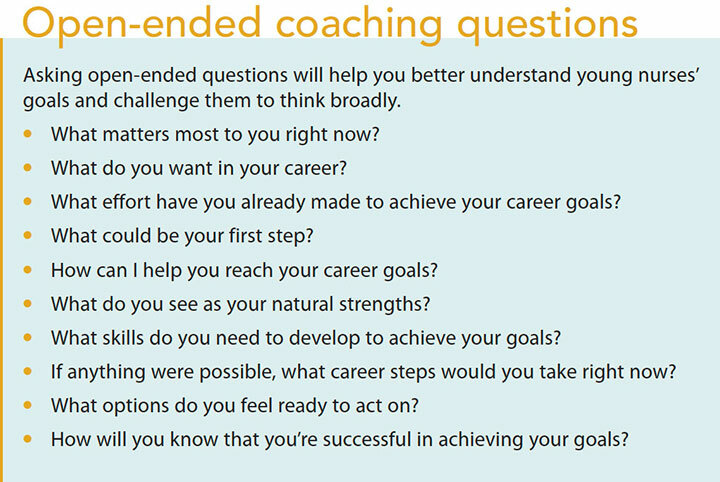 The questions can include challenging the assumptions that Robert has about his career trajectory. Karen should use this step to build an atmosphere of trust and convey an authentic desire to help Robert plan his career. At this stage, Karen and Robert should collaborate on specific goals and develop a plan. They should discuss strategies for growing in place and make a mutual commitment to act. To be most effective, the plan should be in writing and formalized with dates, times, and activities. During follow-up, progress is tracked and evaluated, and coaching feedback is provided. Revisions can be made to the plan and both Karen and Robert can provide input on the success of the career coaching. Many nurse leaders worry about the time that coaching can take. It does require a time investment, but the rewards can far outweigh the time spent. As nurse leaders look for ways to reduce turnover and promote staff, learning to coach others can serve you well. These sessions can be short but meaningful. The follow-up and follow-through are what’s most important. Many activities can help young nurses achieve their career goals and develop their professionalism and leadership. Training as a preceptor, taking charge nurse classes, serving on committees and task forces, and helping to lead community events are all activities internal to the organization. Recommended external activities include seeking certification, joining a specialty organization, doing a StrengthsFinder assessment, joining a local Toastmasters club, or watching a series of TED Talks. Many organizations offer opportunities for new graduates to spend time shadowing nurses in different roles before making career plans. When a new graduate expresses an interest in advanced practice roles, set up an experience so he or she can explore the role before entering a graduate program. Leader coaches also can be instrumental in planting the seeds of leadership in new graduates with high potential. Career plans should be intentional, and they require both the leader coach and the nurse to follow-up and assess the plan’s effectiveness. Dedicated leadership, staff development, and intentional workplace initiatives are needed to build healthy work environments that enhance professional caring, promote quality patient outcomes, and encourage strong teamwork. Millennials have a restless need to “get ahead” that needs to be proactively addressed. Adopting a leader coach model has been demonstrated to both improve staff development and promote engagement. Conveying belief in young nurses and working to help them grow can be very powerful. Rose O. Sherman is a professor of nursing and director of the Nursing Leadership Institute at the Christine E. Lynn College of Nursing at Florida Atlantic University in Boca Raton. You can read her blog at emergingrnleader.com. Bungay Stanier M. The Coaching Habit: Say Less, Ask More & Change the Way You Lead Forever. Toronto: Box of Crayons Press; 2016. Faller M, Gogek J. 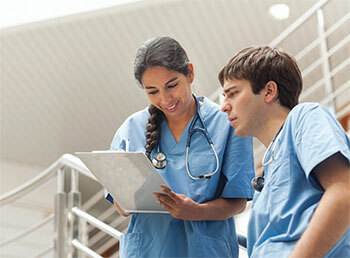 Will the trend toward higher education impact nurse supply? Implications for workforce planning. Nurse Lead. 2016;14(6):433-7. Kowalski K, Casper C. The coaching process: An effective tool for professional development. Nurs Adm Q. 2007;31(2):171-9. Sherman RO. The leader coach. Nurse Lead. 2017;15(3):154-5.